So, you’ve been dreaming about a spinning reel that is incredibly durable and robust, one that has a drag system that is as smooth as silk yet offers plenty of grunt to battle the big pelagic’s, a reel with a tightly sealed design that keeps out the salt water and sand. Oh, and also this reel looks incredibly stylish! Now that was a pretty dramatic entrance! Does this reel really live up to these dream-like qualities? That’s exactly what we are going to discover here in this detailed review of the Penn Slammer III spinning reel. The Slammer 3 has a wide range of sizes available, starting with the smallest at 3500, all the way up to the biggest size of 10,500. The 10,500 is actually the biggest spinning reel size that Penn offers, and is only found in the Slammer III and Spinfisher V ranges by Penn. As you can see, there are two HS (High Speed) model of the Penn Slammer III available, the 6500HS and the 8500HS. The High Speed models are designed for anglers that need to retrieve lures at a higher speed, often when using surface lures for fast fish such as tuna and wahoo. The line retrieve on the Slammer 3 6500HS is 48 inches per crank, versus 42 inches for the regular 6500 Slammer 3 model, and the 8500HS has 50 inches of line per crank, versus 42 inches per crank for the regular Slammer 3 8500 model. 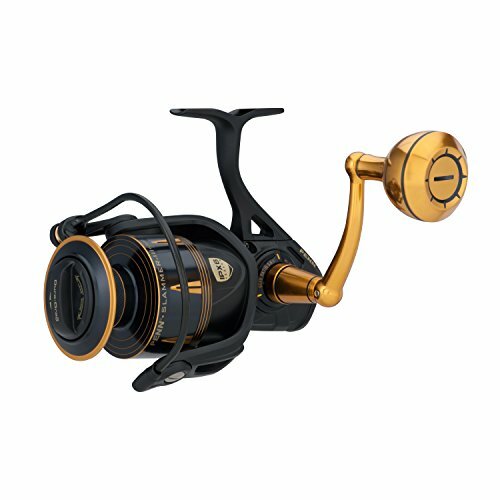 Both of these HS reels have a different color scheme to them than the regular models, being an attractive red on black, rather than the gold on black that the regular models use. When you are out on the ocean, inevitably your gear is going to get covered in salt water, whether it’s just from spray as the boat goes along, or it may get an actual drenching if a wave comes over the side. So to give you the best protection from these kind of conditions, Penn has made the Slammer 3 with an IPX6 waterproof rating. An IPX6 rating means that the reel is splash proof, so can withstand the conditions you will encounter on a boat trip. The Slammer III design has the key internal elements such as the drag system and gear box tightly sealed so they keep salt water and sand out. This will not only keep the reel running at its optimal levels at all times, but also ensure that you get years of usage from the reel too. 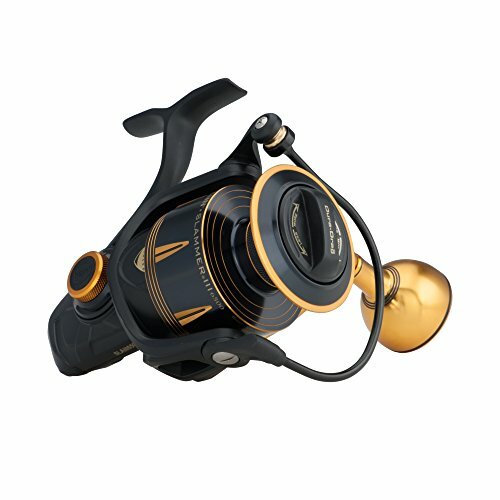 The drag system used in most of the spinning reels from Penn is the HT-100 system, and this is an extremely powerful drag that has become one of the key selling points for Penn’s spinning reels over the years. But for the Slammer 3, Penn has gone one step further and implemented their new Dura-Drag system on the reel. This new system allows for increased drag pressure, and an incredibly smooth operation. Dura Drag uses a proprietary material that is based on the same material used in the transmissions of high-performance racing cars. It is designed to endure the frequent brutal encounters it will have with hard fighting fish, and keep the drag system running as smooth as it does at all times. This drag system is extremely effective, and as soon as you experience the drag in operation you quickly understand the level of quality and precision that has gone into its design. Another key element of the Penn Slammer is the CNC gear technology. The entire gear system is made from brass, that has been machine precision milled. This provides more durability and a very smooth operation. This gear technology also gives the reel an incredible amount of cranking power. When you hook into a big fish, you want to feel like you can keep it under control, and the CNC gear technology, coupled with the Dura Drag system will certainly give you that ability. It’s fair to say that the Slammer 3 reel is not that light. You do get that solid feel to it, and it certainly feels very well built, but compared to some of the premium spinning reels available, this does carry a bit of weight to it. 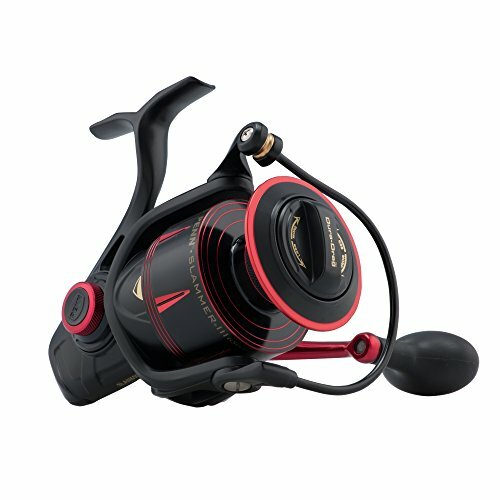 But let’s not forget, this is a reel that is in the $207 to $260 price bracket, depending on what size you want. Penn uses a couple of different handle knobs on their spinning reels. One of them is the aluminium knob, and the other is the EVA knob. Preference is obviously down to the individual, so to accommodate for everyone’s preference, the Slammer III comes with both the aluminium and EVA handles. The handle can also be interchanged between left and right hand side of the reel, so will suit either preference. If you are familiar with some of Penn’s other spinning reel models, then you will probably have seen line capacity rings on the bottom of the spools. This is a very useful measurement that will allow you to gauge just how much line you have left on the spool if you’re fishing deep, or you’ve been taken on a big run by a fish. The Slammer 3 also has the line capacity rings on the underside of the top of the spool as well, so you can see the available line left from all angles. It is hard to find much wrong with the Slammer 3 spinning reel. Yes, it is a fairly heavy reel, but at the same time it’s not the heaviest out there. It may not have a myriad of uniquely named features, as some other brands tend to focus on in their marketing spiel, but what it does have are some extremely effective design elements that improve the performance of the reel significantly. Let’s not forget, that while the Slammer 3 may set you back around a couple of hundred bucks (prices do vary dependent on the model you choose), this is far from being a premium priced reel. And what you do get for you money offers extreme value as this is one tough reel that has been built to last, so you can expect to get many years of usage from it. Whether you choose the regular, or high speed models of the Penn Slammer 3, this is a superb reel that will give you the ability to do battle and dominate those big fish!